Oonagh is an actively engaged citizen and business person. She has been involved with Transition Towns Ennistymon, Ennistymon Tidy Towns, and more recently the Moyhill Community Garden Project. She worked as an Organic Horticulture Tutor for 4 years with Clare Local Development Company and is a member of Clare Local Development Company. She is currently a member of the Burren Ecotourism Network, having joined in 2014. 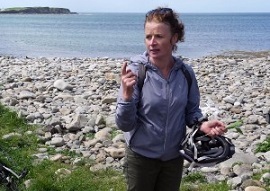 Oonagh is an active member of the Burren Ecotourism Network, contributing to a number of sub-committees, namely Conservation & Advocacy Sub-group, Burren Food Trail and the Sustainable Travel Group.